We are living in the golden age of beauty influencer marketing. From YouTube stars garnering millions of video views to Instagrammers with millions of followers, beauty and personal care influencers and topic experts are more impactful than ever in the eyes of consumers. 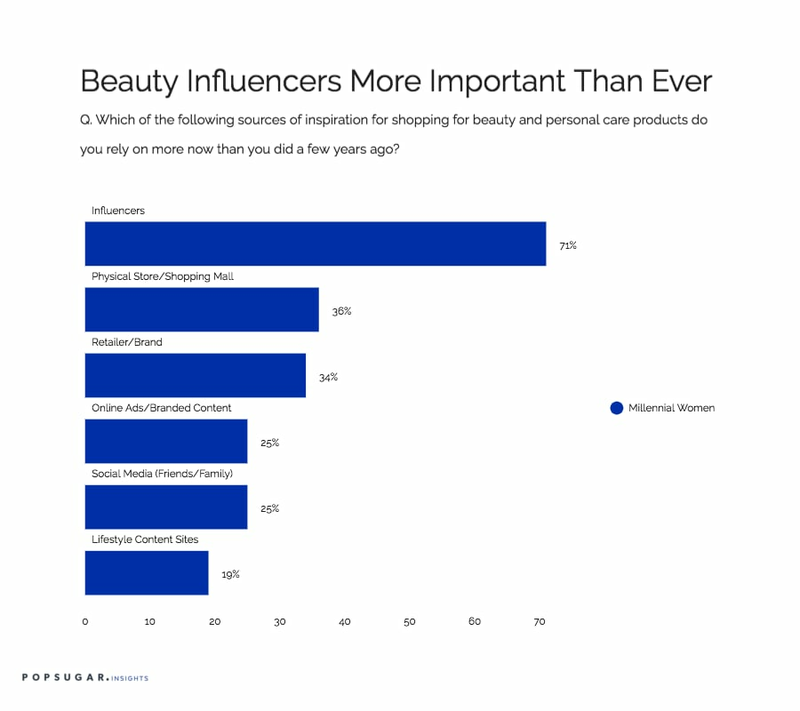 As part of the POPSUGAR Insights study "Beauty Evolved: How Millennial Women Shop for Beauty and Personal Care," we wanted to examine how this trend has evolved over time, so we asked women to tell us which sources of influence are more important to them now than a few years ago. Overall, influencers ranked number one among millennial women, with 71% saying that influencers are more important to them now than they were a few years ago. This is especially true of bloggers and topical experts (51%), but even celebrities have risen in influence (20%). Influencers not only inspire, but they also drive women to purchase. Over 65% of millennial women have followed an influencer in order to get beauty tips and obtain information on what beauty products to purchase. While there have been many media stories about the death of physical stores and shopping malls, the truth is that those channels are undergoing a profound evolution, and while some individual stores and malls may in fact be dying, others are evolving and adapting to reflect the changing times, offering experiences and providing women with a strong reason to shop in person. This is reflected in the data, which show that 36% of millennial women say that physical stores and shopping malls are more influential as sources of inspiration for beauty shopping than they were even a few years ago. Perhaps not surprisingly, as more time spent continues to migrate to digital channels, millennial women consider a retailer or beauty brand's website and social media channels (34%) to be important sources of inspiration for their shopping experiences. Additionally, online ads and branded content (25%) are cited by one in four millennial women as more influential now than ever, perhaps reflecting how beauty marketers have begun to invest in developing content that aims to entertain, inspire, and inform, as much as it does to sell product.